New Brunswick, N.J. – A $1 million grant from Gateway for Cancer Research will help Rutgers Cancer Institute of New Jersey Urologic Oncology Chief Isaac Yi Kim, MD, PhD, MBA evaluate the impact of surgically removing the prostate in men with metastatic prostate cancer in the United States and Asia. By year’s end, it is estimated that 161,000 U.S. men will be diagnosed with prostate cancer. For most, the disease will be localized. But for the 5 percent whose cancer has spread, or metastasized, to distant lymph nodes or organs, only 29 percent are likely to survive five years after diagnosis, according to data from the National Cancer Institute’s Surveillance, Epidemiology and End Results Program. The grant will support a clinical trial that will accrue participants from two dozen academic institutions in the U.S., Japan, Korea, Hong Kong, and Singapore. Over three years, 190 patients who take part in the randomized study will receive either chemo-hormonal therapy or therapy plus cytoreductive surgery that removes both the prostate and surrounding cancerous cells. 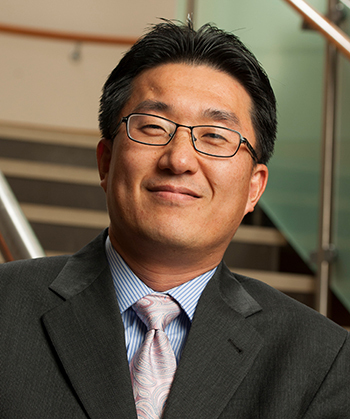 Dr. Kim, who leads the Prostate Cancer Program at Rutgers Cancer Institute, and his team will measure the impact of these treatments on the patients’ disease and quality-of-life outcomes. “I am grateful for this support from Gateway for Cancer Research, as results of this study could lead to more precise and personalized care for men who present with metastatic prostate cancer and, possibly, improve their survival rates,” notes Kim, who is also an associate professor of surgery at Rutgers Robert Wood Johnson Medical School. Rutgers Cancer Institute, along with its partner RWJBarnabas Health, offers the most advanced cancer treatment options including clinical trials and novel therapeutics such as precision medicine and immunotherapy – many of which are not available at other facilities across the state. Patients have access to these cutting-edge therapies throughout the state at Rutgers Cancer Institute of New Jersey in New Brunswick, Rutgers Cancer Institute of New Jersey at University Hospital in Newark, as well as at RWJBarnabas Health. Along with world-class treatment, which is often fueled by on-site research conducted in Rutgers Cancer Institute laboratories, patients and their families also can seek cancer preventative services and education resources throughout the Rutgers Cancer Institute and RWJBarnabas footprint statewide. To make a tax-deductible gift to support the Cancer Institute of New Jersey, call 848-932-8013 or visit www.cinj.org/giving. Follow us on Facebook at www.facebook.com/TheCINJ. Gateway for Cancer Research is a nonprofit 501(c)(3) organization committed to funding innovative cancer research that helps people with cancer to feel better, live longer and conquer cancer TODAY! Thanks to generous underwriting, 99 cents of every dollar Gateway receives directly funds Phase I and Phase II cancer clinical trials at leading research institutions across the country and abroad. Since 1991, Gateway has supported more than 150 clinical trials and funded millions in breakthrough research. Get involved today by visiting GatewayCR.org, like us on Facebook at facebook.com/demandcures and join the conversation on Twitter @DemandCures, #BeAGateway.